Every mom is good at something, or perhaps a number of things; my own Mama has, among her many talents, an amazing design eye, ninja sewing skills, a green thumb she didn't pass on to me and is my own personal voice of reason. 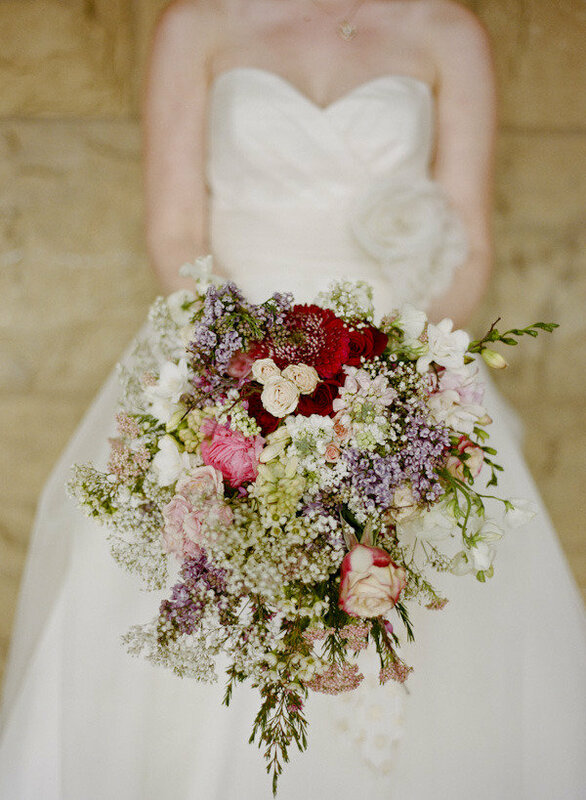 But she can't (as far as I know, since I've never asked) arrange a bouquet as gorgeous as this mother-of-the-bride designed beauty; can you believe that's a DIY project? Tell me, what's your mom's secret skill? Is she a phenomenal seamstress like yesterday's mother of the bride, a terrific storyteller, or a wonderful cook? wowsa. Can I just say that white and more white with a pop of color will forever be my favorite approach to a wedding? Wow! That is an incredible bouquet! My mom can cook, clean, and sew like no one's business but hasn't done it in a long time. Sigh. Oh, wow!! This is breathtaking! I can't believe it's a DIY...I wish that was my talent :) My mom is wonderful at so many things, but I think one of her best talents is her ability to make every place we live in feel so homey. When I left for college and my brother took my room, I got moved into the teeny tiny office. By the time I got home for Christmas, my mom had transformed it into the cutest, coziest little bedroom nook! My mom also has an amazing green thumb, which she got from her dad. Love perusing around her gigantic garden and seeing all of the lovely little plants and flowers! Amazing, simply amazing this is a DIY-bouquet! My Mom can cook, bake & sew . . . none of which she passed on to me. Unbelievable!! My Mom can knit and embroider....ohhh how I wish I could knit! My mom is an amazing cook and she's AWESOME at wrapping presents. One word "WOW!". Ok more words are needed...this is is gorgeous! whoa my mom could never recreate that gorgeous bouquet but she can bake the best cakes! I think my mom's secret skill is creating amazing tablescapes. She could kill Martha's. Just sayin'. wow! What an amazing bouquet. no, I wouldn't have guessed this wasn't done by a pro. WOW!! Gorgeous! My mom has soo many talents that I wish she had passed on to me (green thumb included -- mine is definitely black). I wish I had ninja sewing skills. the money I'd save at the tailors! i'm sad to say my mom's best skill is probably shopping or spending money, not something amazingly useful at times and WOW this bouquet is amazing! my gosh that bouquet is so beautiful! Such an incredibly lovely bouquet. My mother is a phenomenal listener. She can help me talk through just about anything. My mom can quilt up a masterpiece :) I'm waiting on my newest one any day now! My mom's secret skill has to be the ability to stay calm under any kind of circumstance. Seriously. She is never flustered. It's frightening. Oh my gosh, that bouquet is exquisite. Mumsy is definitely the tops! Always coming to the rescue, she continues to amaze me even after all these years, a tres talented lady in every sense! For most of my life I thought my mom was always wrong about everything (don't we all, as adolescents?) but as I've gotten older I realize that she is practically always right. About everything. I call her almost every day to ask her questions: how long to cook squash, the milk:lemonjuice ratio to substitute for buttermilk, how late the drycleaners is open...so many things I could check the internets for, but I'd rather ask her! that is a beautiful bouquet~!